Hokusai was born in 1760, sometime in October or November. He was born in the Honjo neighbourhood in Edo (present-day Tokyo), close to the Sumida River and to the countryside. At the age of four, he was adopted by Nakajima Ise, a mirror designer for the Tokugawa royal family. Between 1774 and 1775, he became a woodcutter, engraving the designs of local painters. Only three years later, though, he put an end to this activity in order to become an artist himself, refusing to be a simple interpreter or translator of others’ talent. Ink on paper, 26.9 x 16.9 cm. He adopted the new name of Sōri, refusing to belong to any studio. From 1795 he produced many designs for surimono, deluxe single-sheet prints of poems with illustrations, made to be distributed privately, rather than in book or print shops. His style had by then changed radically, and it would continue to do so in two series of landscape prints from 1800-1805, where he adopted formal lessons of Western art. Now signing as Katsushika Hokusai (the name by which we know him today), he became a celebrated artist and attracted a large number of followers. Perhaps the best example of his acclaim was the Hokusai Manga, a series of sketchbooks published in 1814. They became tremendously popular and continued to be reprinted well into the second half of the 19th century. from the series Snow, Moon, and Flowers (Setsugekka), c. 1831-1835. Ōban, nishiki-e (polychrome woodblock print), 25 x 36.6 cm. After a brief new venture into the production of surimono, Hokusai returned to the world of commercial publishing at the end of the 1820s, now under the new name of I-itsu. Between around 1830 to 1835, his first remarkable series of landscapes, Thirty-Six Views of Mount Fuji, was published. The 1830s proved to be a fruitful decade, as he produced many of his best-known series, such as Visiting Famous Waterfalls of Japan, Eight Views of the Ryūkyū Islands, Mirror of Chinese and Japanese Poems, and another take on Mount Fuji, this time in One Hundred Views in the form of an illustrated book. 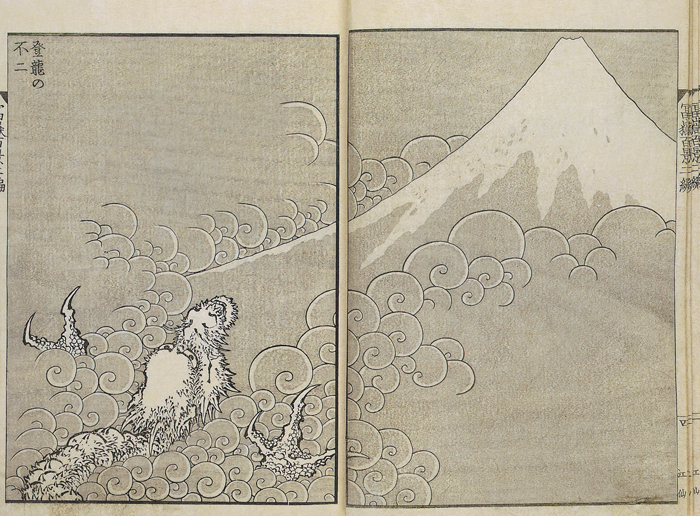 These proved to be Hokusai’s masterpiece in book illustration. 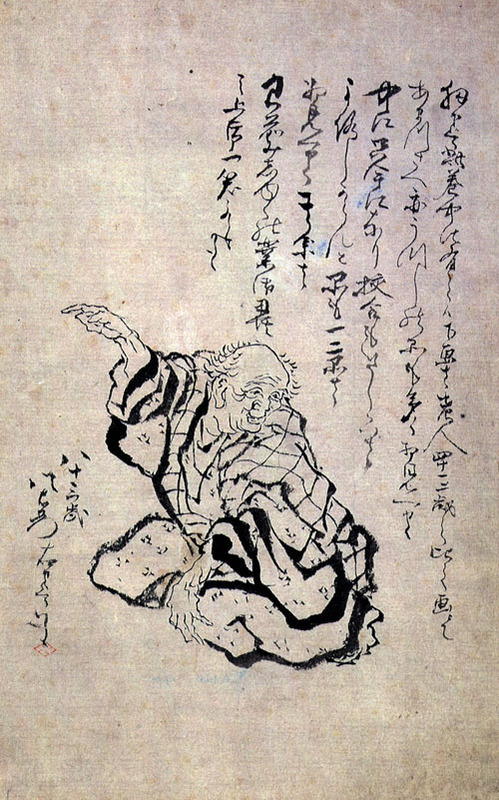 He saw it as a new phase in his career, thus adopting yet another name, gakyrōjin Manji (gakyorōjin meaning ‘the old man mad about drawing’). Views of Mount Fuji (Fugaku hyakkei), vol. II, 1835. Sumizuri-e (monochrome woodblock print), 22.6 x 15.6 cm (each page). The years 1836-1838 saw the height of the Tempō crisis, a time of widespread famine and financial hardship, which provoked a collapse in the demand for prints and printed books. Hokusai became extremely poor because of this, and was said to have been trying to sell his drawings in the streets. Along with many other people, he left Edo and fled to the countryside. Despite printing one last series of single prints (One Hundred Poems Explained by the Nurse) on his return, Hokusai’s production rate decreased during the last decade of his life. From then on he would dedicate his main efforts to painting. He died on 18 April 1849 (or possibly on 10 May) and he was buried at Seikyoji Temple in Asakusa, Edo. 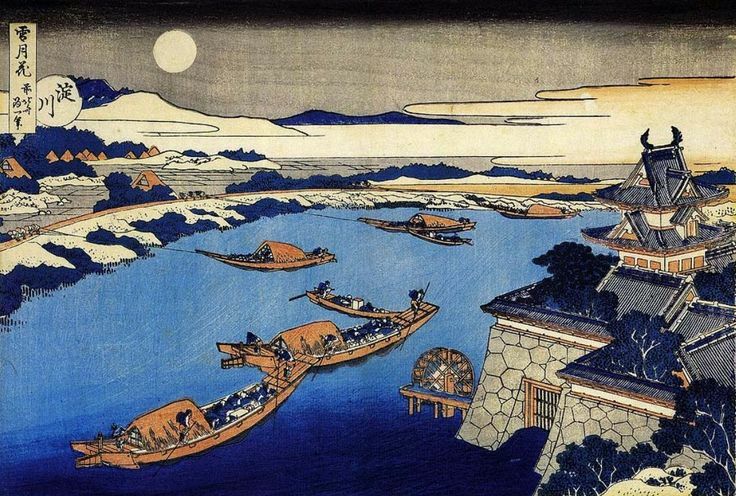 Hokusai was one of the most highly valued artists of his time. He was very popular among the public and proved to be greatly influential, in Japan as well as in the West.